At last, here we gear up for the big end of the mini-series action set piece. 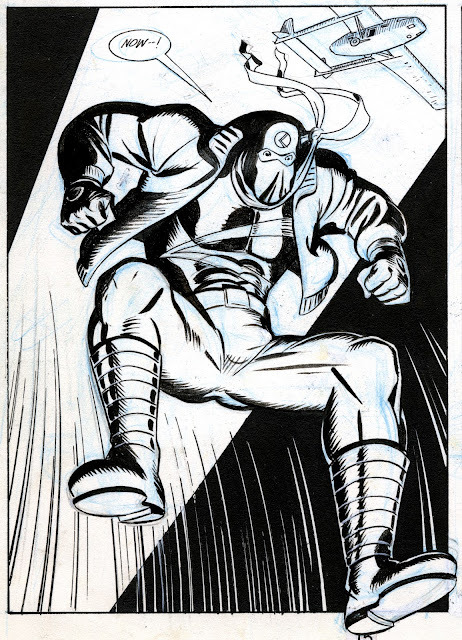 I’m not wild about these pages; I have real difficulty drawing soldiers, weapons and carnage. 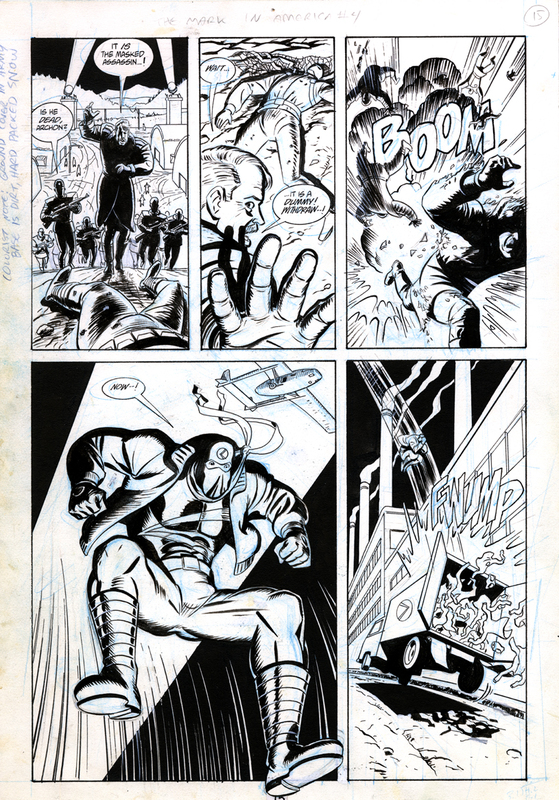 War comics are not my forte or interest, other than some of my favorite artists worked on them. On page 14, the staging in panels 2 and 4 is unclear. In panel 2, posing the Archon tiny within the panel and back-to-cam is a no-no, minimizing one of the most important elements of the panel ((1) the Archon leading a strategy session, (2) detection of the unidentified aircraft). The action doesn’t work with left-to-right/top-to-bottom eye read; possibly the panel should have been flopped. That wouldn’t have corrected the fundamental problem that the panel wasn’t dramatic or dynamic. I suspect that I was influenced by the plot synopsis to try and cram in too much information that was unimportant to that action beat or the story as a whole. 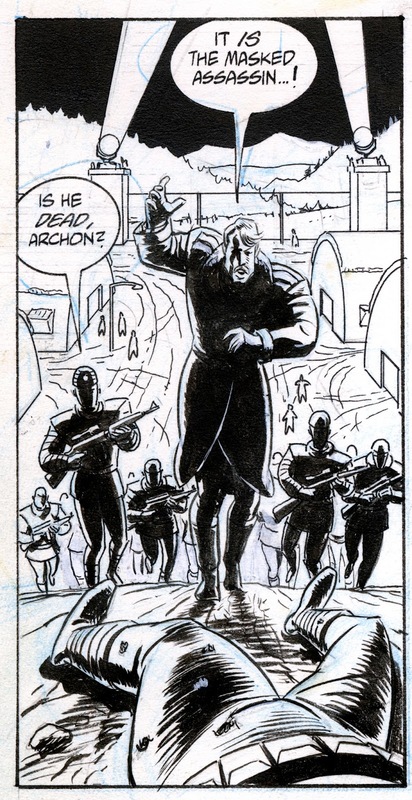 Or perhaps the writer, Mike Barr, intended several panels to establish the Archon plotting strategy to take back Lutzany, andI insisted in condensing it into one panel. 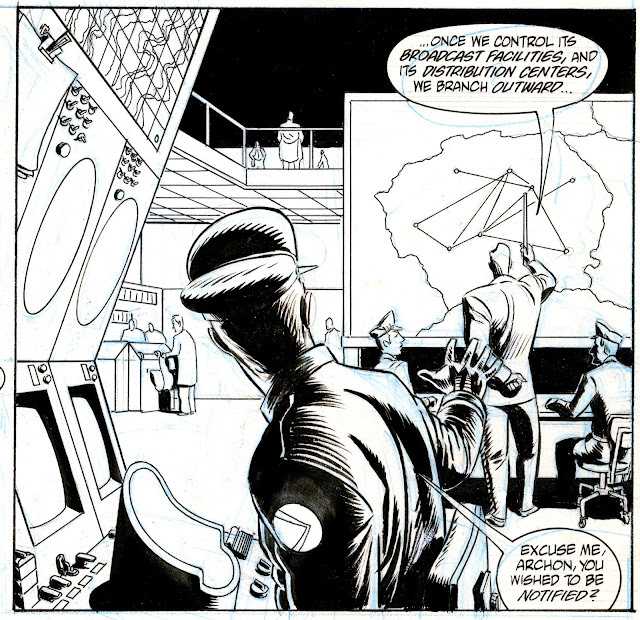 In panel 4 the most important element, the parachute being dropped from the glider, is almost unnoticeable within the composition. The artistic trauma continues with page 15. As I have said, the action set piece of which this page is part has everything I hate drawing in one tidy package. Panel 1 makes me cringe. The drawing of the advancing machine-gun wielding troops is awful; painful to draw and painful to look at 23 years later. Heavy back-lit shadows only partially mitigates the amateurishness. Panel 2… I don’t know how Archon could tell that the supine form is a dummy given that every inch of it is covered with the Mark’s costume. And it had to be thusly so that the suspense beat in page 14, panel 5 (the parachuting Mark being riddled with machine gun fire) would work. Basically I was handed an unsolvable artistic problem: drawing the Mark-as-a-dummy to be ambiguous as such in the first 2 panels of its presentation but recognizable as such in its third appearance. Basically, we need a dialogue cue from the Archon TELLING us that the figure is a dummy; there’s no way to show it visually given the constraints of the first 2 panels. Panel 3. 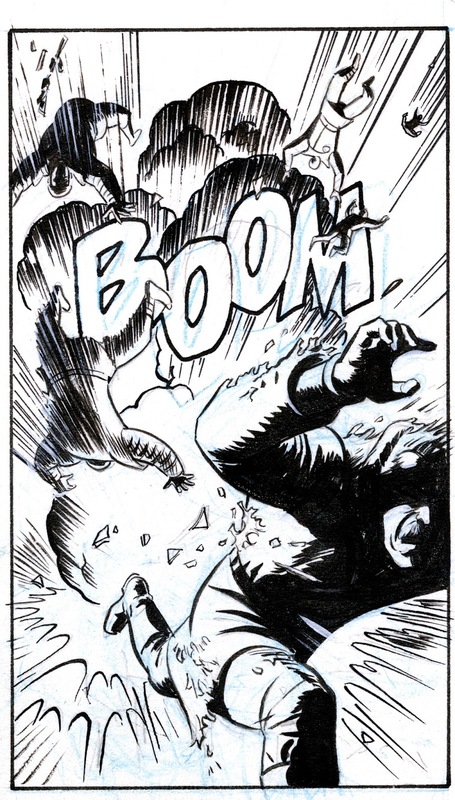 All of the explosions were referenced from Russ Heath war comics. Except for a really cool Bernie Wrightson explosion from an early issue of Swamp Thing that I’ve cannibalized repeatedly over the years. Panel 4. With the Archon’s forces suitable distracted, the Mark himself dives out of the glider sans parachute, allowing me to do a nice presentation panel. I allowed myself the luxury of a slight costume re-design since he’d been in civvies for the previous 2 issues: I ditched the utility belt which I loathed drawing and he never used, and gave him a leather jacket because I thought it looked cool. Panel 5. The convenient laundry truck cushions his landing. This humor beat came from the writer, Mike Barr. I made it work by having the back doors fly open and the laundry explode outward due to the impact. In general, both pages have an amateurish feel. I’m not sure how I’d fix them today, or even (if the series is ever collected) that I’d want to try. As I said, this sequence has everything I loathe drawing in one tidy package.